Francis Cotes (English, 1726-1770), Portrait of Miss Frances Lee, 1769. Milwaukee Art Museum, Gift of Mr. and Mrs. William D. Vogel M1964.5. Photo by Larry Sanders. The Milwaukee Art Museum has in its collection a beautiful portrait by Francis Cotes, one of the highlights of the Museum’s Gallery of 18th century English and Italian Works (gallery #7, main level). Cotes’ story is an interesting one. Francis Cotes’ (English, 1726–1770) fame as a portrait painter in eighteenth-century England was surpassed only by that of Sir Joshua Reynolds and Thomas Gainsborough—and many feel that if he had not died so early in his career at age 44, his name would not have faded into obscurity. Cotes was particularly talented in working with pastel, evident even in his oil paintings which use bright yet delicate colors and contrasting textures. Examples of pastels by Cotes are at the Cleveland Museum of Art and in The Frick Collection. Some oil paintings by Cotes are in the Tate, the Metropolitan Museum of Art, the Museum of Fine Arts in Boston, and the National Museum of Wales. Cotes was particularly successful with likenesses of children, since they have an unaffected immediacy lacking in the more formal, decoratively detailed society portraits. 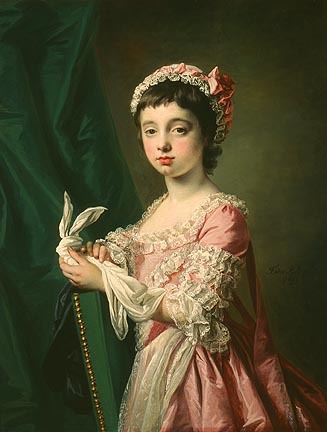 Portraits of children can be found at the J. Paul Getty Museum and the Speed Museum of Art. When the Milwaukee Art Museum’s painting of Miss Frances Lee was completed in 1769, Cotes was the most fashionable portrait painter in London, where he also helped establish the Royal Academy and the British Society of Artists. But who is the subject of our lovely Cotes painting? Young Miss Frances Lee kneels on the seat of the chair. She is quiet but alert, engaging the viewer with her direct, yet innocent gaze. In her right hand is a handkerchief tied in a knot to look like a rabbit. The blended harmonies of pinks, whites, and creams in her dress and skin evoke the sweetness of all little girls her age. Until recently, the only things we knew about Miss Frances Lee was that she lived from 1758 until 1839, and that she was the daughter of Robert Cooper Lee of London and Roxhall, Jamaica. Recently I was contacted by Anne Powers, a woman in England researching her family history. She told me that Frances Lee was the niece of her 5th great-grandmother. Ms. Powers discovered that a distant cousin had a cache of letters from the 18th century written by members of the family—including some by Frances’s immediate relatives. From Anne Powers, I learned that Frances’s father, Robert, had traveled to Jamaica in 1749 to joined his older brother, John. The youngest brother, Joseph, came to Jamaica in 1753. Left penniless when his parents died, Robert made his fortune in Jamaica and returned to England in 1771 a very wealthy man. I have had her Picture drawn by Cotes who is in great repute here and is considered as next to Reynolds in the Art and when it is completed it shall be sent to you by the first safe Opportunity – the Price will be a few Guineas beyond the sum you mentioned which I apprehend will not be disagreeable to you as it will always remain a handsome Picture even after she has outgrown the likeness. And so, with these previously undiscovered primary resources, we not only have more information about Frances Lee, but we have 18th century documents referring to the painting itself! A final note: Frances never married, but the painting apparently stayed in her family after her death in 1839 until later that century. It changed hands a number of times in the early 20th century until in 1937 it was purchased by Mr. and Mrs. Ralph Booth of Detroit. Then it came by family descent to Mrs. William D. Vogel of Milwaukee, who gave the picture to the Milwaukee Art Center in 1964. This entry was posted in Art, Curatorial and tagged 18th Century Art, english art, Frances Lee, Francis Cotes, Sir Joshua Reynolds, Thomas Gainsborough. Bookmark the permalink. Having framed art paintings will allow you to enjoy many different protective aspects. Some of these aspects are ones that you might not have thought about before, but are ones that you will want to take into consideration as the value of art continues to grow. Thank you for the backstory; I adore this painting. Miss Frances Lee reminds me so much of my nine-year-old daughter. I have a Francis Cotes original oil and I love it. The “Constantia Maria Armstrong” portrait.